The aquatic environment is shaped by complex interactions among a variety of physical, chemical, and biological factors. For example, physical factors such as climate, land topography, bedrock geology, and soil type influence the amount of water flowing in streams and discharging to lakes, as well as the types of materials (chemicals and particulates) found in the water. In turn, these physical and chemical factors support a community of biological organisms unique to a water environment. The presence and abundance of light in lakes control many biological processes. Green plants convert the light energy of the Sun into chemical energy (and ultimately plant tissue) through a process called photosynthesis. As sunlight strikes water, it is reflected from the surface (much like a mirror), scattered by particles in the water, and absorbed by the water itself. Gradually, much of the light gets used up until there is not enough light energy remaining at depth to support plant photosynthesis. The surface depths of a lake that receive sufficient light to allow photosynthesis make up the euphotic zone. The lower limit of the euphotic zone is approximated by the 1-percent light level, or that depth where only 1 percent of the surface sunlight remains. The depth of the euphotic may be a little as 1 meter (3 feet) in very turbid (cloudy) lakes to as much as 31 meters (100 feet) in very clear lakes. 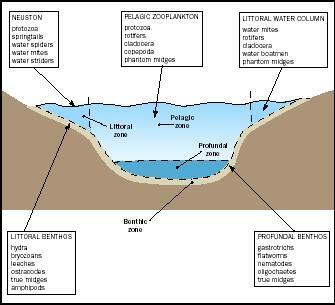 The shallow, nearshore waters of the lake where light penetrates all the way to the bottom is called the littoral zone (see the figure). The littoral community is considered the most diverse and abundant biological community in lakes. In the littoral community, plants (macrophytes) rooted in the sediments receive enough light to grow. Some rooted plants (emergents), such as cattails, emerge from the water surface. Other plants (floating-leaved), such as water lilies, have leaves that float on the surface. Still other plants (submergents) stay entirely submerged. The diversity of plants and the structure they add to the littoral zone attract an abundance of aquatic life. Many fish build nests here, and young fish find protection among the plants from predators. A multitude of aquatic insects (food for many fish) live on and feed among the plants and sediments of the littoral. Turtles, frogs, and many other aquatic organisms call the littoral community home. The zone of open, deeper water found farther out from the littoral zone is the pelagic community. Here, light is still abundant, and the waters are frequently mixed by wind. Tiny, free-floating plants and animals (plankton) live here along with cruising fish. Each lake zone supports a different biological community, whose organisms are adapted to specific light, temperature, and chemical conditions. This diagram lists a few representative invertebrate groups that might be found in a small lake. mollusks, worms, and midge larvae—live in this benthic community and derive their food from the sediments. Water is a medium of extreme properties that strongly shape the nature of the organisms that can survive in it. Thus, life in the water requires special adaptations. Oxygen, plentiful in the atmosphere for land animals, is much less abundant in water. Air-breathing aquatic organisms must have specialized and efficient mechanisms, such as gills, to extract oxygen from water. Except for benthic organisms that live on the lake or stream bottom, most aquatic organisms require some means to regulate their buoyancy so that they can remain suspended in the water. Many fish have air bladders, lightweight bones, and scales—all adaptations to increase buoyancy. Plankton may have long spines or elaborate shapes to increase their surface area which slows down their sinking rate. Because ponds or streams may dry up, many aquatic organisms can enter a resting stage during development or may aestivate , as some amphibians may do in summer drought. On the other hand, the annual range in natural water temperatures (approximately 0 to 30°C, or 32 to 86°F in temperate areas) is much lower than the range that land plants and animals must face (−28 to 40°C, or −18 to 104°F). Aquatic plants and animals interact with each other through a series of interconnecting pathways called a food web. Each different level in the food web or chain is called a trophic level because each represents a different type of productivity. 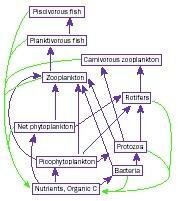 The schematic below illustrates the food web and microbial loop for the pelagic zone of a typical fresh-water lake. Microbes are important in enabling and sustaining nutrient cycles. Zooplankton , such as the shrimp-like Daphnia and Bosmina, are the primary consumers because they eat the primary producers. Zooplankton are considered herbivores because they consume plant material and are the functional equivalent of cows or rabbits on land. Planktivores are organisms that eat zooplankton. Aquatic organisms that are planktivorous include fish, such as minnows, small sunfish, and gizzard shad, as well as a variety of aquatic insect larvae. The piscivores are at the top of the aquatic food web and are fish-eating fish, such as bass, pike, and walleye. Piscivores are keystone species, in that their influence may cascade down the food web, affecting other organisms in lower trophic levels. For example, if the piscivore population is too high, they could eat all the planktivores. Without the fish planktivores to eat them, the zooplankton population could increase and do a better job feeding on the algae. This would lead to an increase in lake transparency. The reverse effect can happen if too few piscivores exist, which may be a result of overfishing or poor reproduction. SEE ALSO Algal Blooms in Fresh Water ; Ecology, Fresh- WATER ; Lake Health, Assessing ; Lake Management Issues ; Lakes: Chemical Processes ; Life in Water ; Microbes in Lakes and Streams ; Nutrients in Lake and Streams ; Plankton . Moss, Brian Ecology of Fresh Waters, 3rd ed. Oxford, U.K.: Blackwell Science, 1998. * See the "Ecology, Fresh-Water" entry for a summary table of fresh-water algal groups.